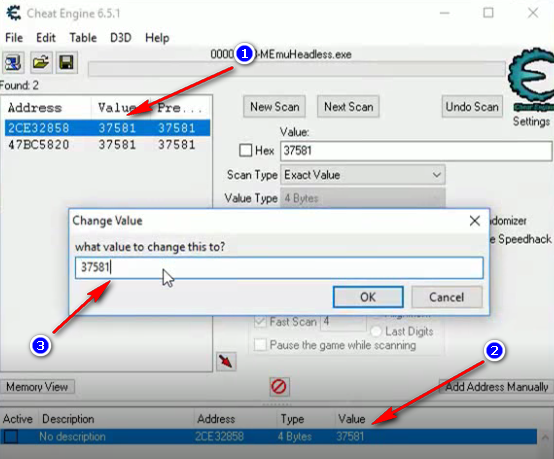 Welcome back, this is the first of the articles created to provide a guide to the use of Cheat Engine on a specific game. The chosen game to start is Pixel Dungeon Hero. 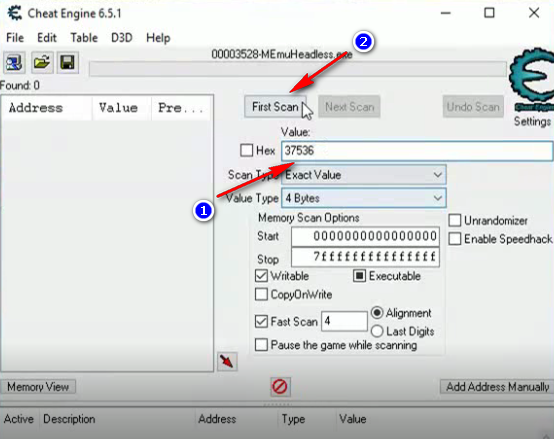 In the article How to Use Cheat Engine on Android Games – No Root i have already shown how to use Cheat Engine with an Android Emulator for PC, however, to speed up the search for cheats and have more possibilities and range, i chose not to use Bluestacks for cheats, replacing it with MEMU. First we start MEMU and load the game Pixel Dungeon Hero, after the loading, will be displayed its main screen. As you can see in the following figure, the process is called MEmuHeadlless.exe. Well done, we are ready to look for the cheat for Pixel Dungeon Hero. 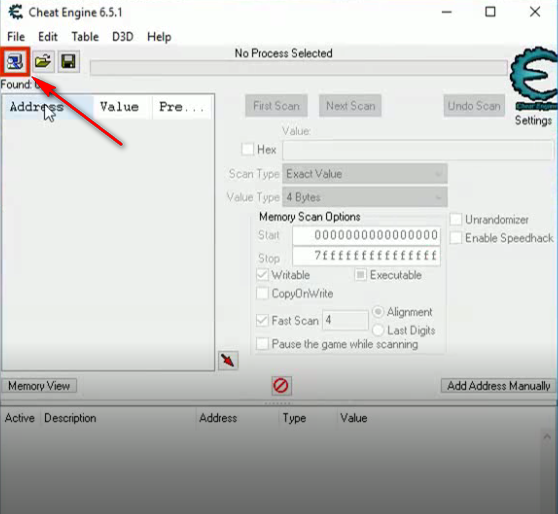 Let’s go back to the Cheat Engine‘s main screen, insert into the search field (1) the amount of money it possesses at this time in the game (see figure 1) and start searching (2). After a moment, the search will return the first address. If the results are few, we can directly try to change the value, otherwise we will redirect the search after changing the amount of money (for example, selling some equipment or buying a level up), this time by using the “Next Scan” button instead of “First Scan”. As you can see from the figure at the second step i managed to get only two values. Let’s try to change the value. To do this click on one of the addresses (1), this will be added between the addresses highlighted below (2), clicking on it will open a window (3) on which we can enter the new value. The chosen address is the right one and the amount of money in the game has been altered successfully. Now we can increase how many times we want the money and make the game simpler. 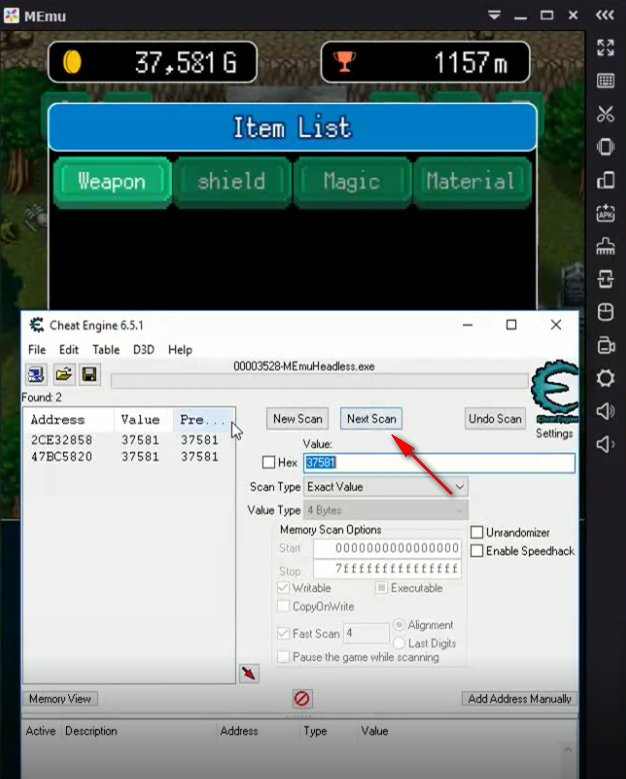 In order to play on your Android device, with Pixel Dungeon Hero, with the cheat just created, you can export the saving of your game. 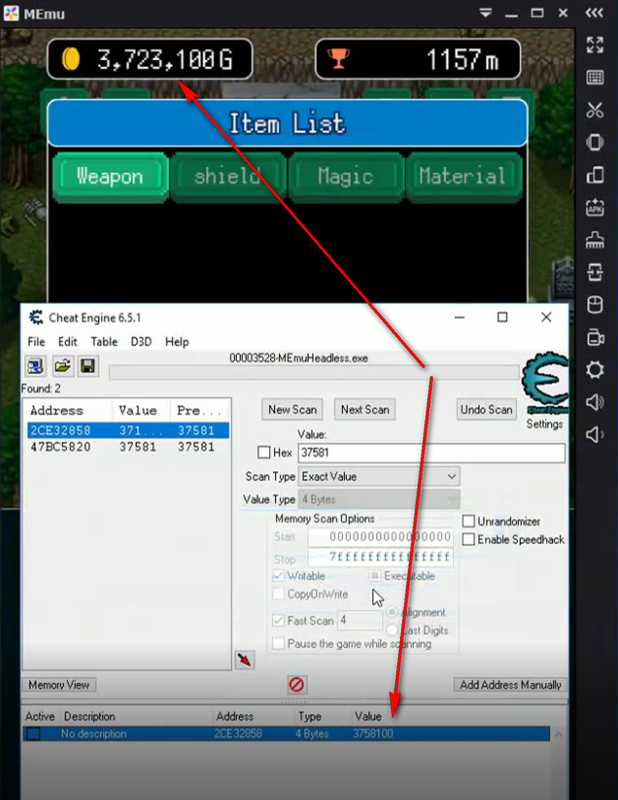 To see how, read the article Export dei savegames da Bluestacks – Usate cheat engine su Pc, giocate sul vostro dispositivo. 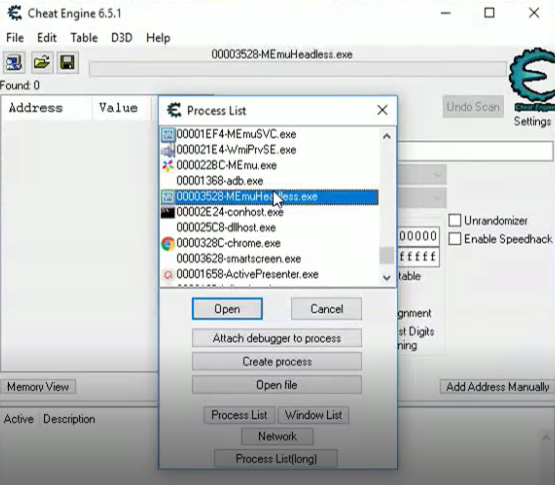 This article describes the whole process for transferring the cheats found from the emulator on the PC to your mobile device. 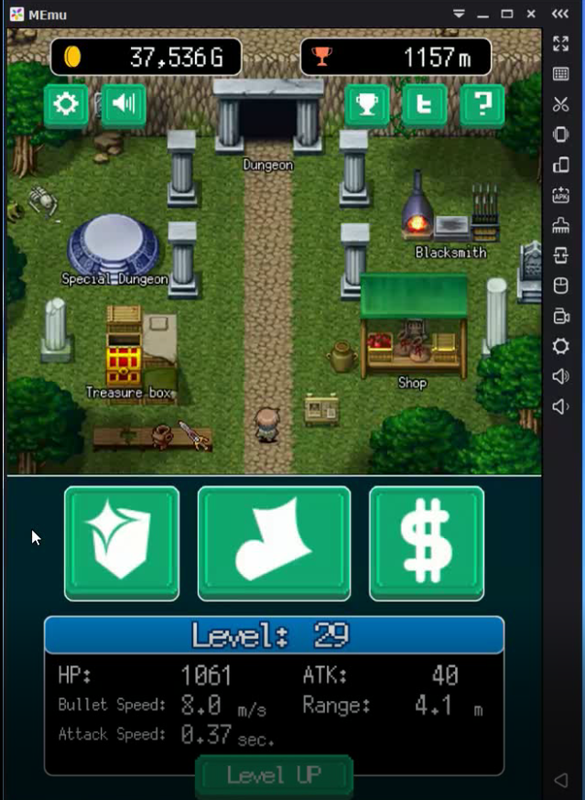 Although the article was created with Bluestacks, the process is identical and you can use it with all emulators. My usual advice is always to not overdo it otherwise even if the game likes it, after a while it will completely lose the taste of playing. That’s all, the next article, and if you liked it or you want to stay informed on the latest news, please subscribe to my channel. Your every intervention is a motivation for me to keep writing for you.